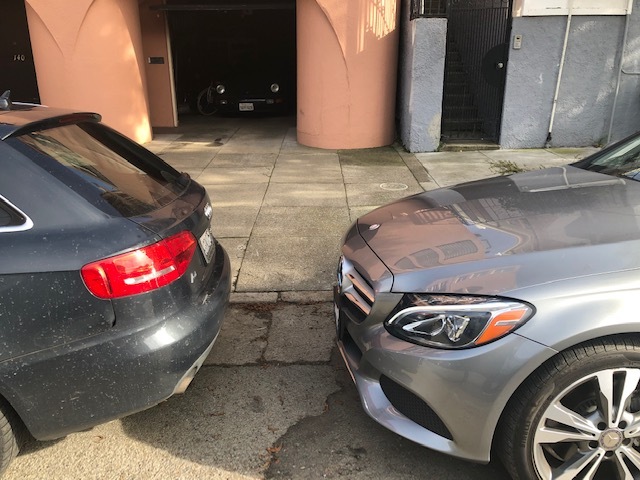 Parking can be challenging sometimes in our Presidio Heights neighborhood because of the neverending construction which takes up parking spaces. We park on the street because we don’t have a garage. Normally, we can park within a block or two of our place but at times during the day, it can be a little more challenging. This brings me to January 10 after we had just come back from the holidays. On that date, I drove back from an early morning business meeting and circled the block a few times looking for a space. Then I saw a space on Presidio Avenue and parked. I noticed that the curb cut was further beyond the garage so when I parked my car even though it was within the curb cut, I made sure it was not blocking the garage. It appeared that this curb cut was an older one that had likely been made before the present building was in place. I planned to park my car there only for part of the day since I had another business meeting that afternoon. A little more than 2 hours after I had parked, a traffic officer came to my door. He informed me that I was blocking a driveway. That surprised me since I knew I wasn’t blocking any driveway. He told me that if you park within a curb cut even if you are not blocking a driveway, it is still considered blocking a driveway. “It is generally illegal to park in front of a driveway or past a “curb cut,” which is the point where the curb starts to slope downward and the driveway begins…[I]f your vehicle extends into the red zone or the curb cut, you may get a ticket and/or towed. Driveway violations are only enforced when someone makes a complaint, and a parking control officer determines that there is a violation.” “San Francisco Parking Tips: Parking Around Driveways” SFMTA October 12, 2016. After only 2 hours my neighbor up the street reported me even though I was not blocking her garage in any way – look at the photo! My car is the silver one; hers is the blue car actually blocking the driveway. What do you think? I was unfamiliar with this law so now I am making all of you familiar with it so that you don’t get a $110 ticket or worse – towed! I’m thankful I was home because if the officer hadn’t found me, my car would have been towed and that would have been a much bigger headache and several hundred dollars more in fines. Thanks, Neighbor! Previous: My Favorite Holiday Traditions! Next: Be Careful About Asking Tenants to Move Out!